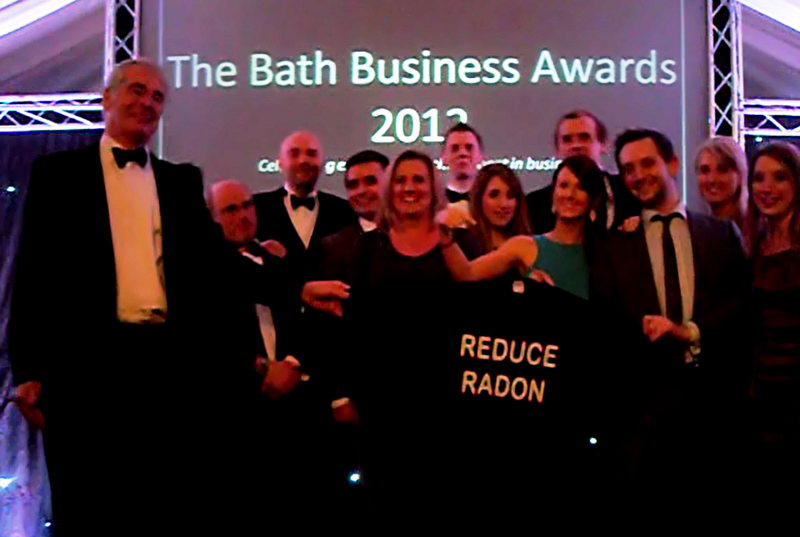 The message of the ‘Reduce Radon’ campaign was broadcast to hundreds of Bath’s top businesses at an awards ceremony held last week. 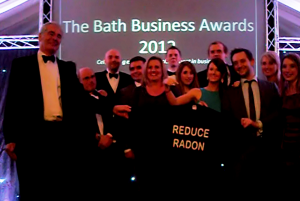 UK Radon Tee World Trek co-ordinators, propertECO were delighted to secure the attention of the city’s business elite by promoting the need to test properties for the naturally occurring radioactive gas, radon. Bath is a known radon ‘affected area’ and maps produced by the Health Protection Agency estimate that more than 30% of properties in certain parts of the city will contain elevated levels of radon. As radon cannot be seen or smelt, tests must be carried out using special monitors to determine whether a property has high concentrations of the gas. If left undetected, long term exposure to radon leads to an increased risk of lung cancer and is responsible for over 2000 UK deaths from the disease every year. The Bath Business Awards 2012, organised by the Bath Chronicle and hosted by former Blue Peter presenter Valerie Singleton, were held at Bath Racecourse to celebrate the achievements of local companies. propertECO picked up the award for Most Innovative Start-Up of the Year thanks to their range of services aimed at increasing the sustainability of buildings. As a building cannot be truly sustainable if it is not healthy to occupy, propertECO’s specialist services include radon testing and remediation and the company is active in promoting awareness of the health risk amongst professionals and the public.